The article below is taken from The Star dated 22nd March 2012. PETALING JAYA: The Government will not allow the Lynas rare earth project in Gebeng, Pahang, to operate if it harms the health of the people and environment, said Prime Minister Datuk Seri Najib Tun Razak. He said a dialogue with those against Lynas was needed so that scientific and technical evidence against the project could be discussed. "I don't want this to be emotional or political. 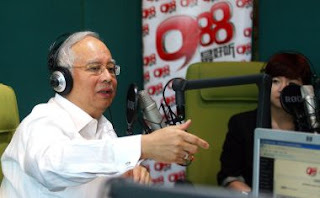 It is unfortunate that an environmental issue had become political," he said in an interview with 988FM radio station Thursday with DJs Tan Yi Hui and Sam Mak. Najib added that the parliamentary select committee that would carry out a study on Lynas would help the government in making its decision on the project. Najib said he has a clear vision and knowledge of what needs to be accomplished for the nation. "But to have that happen, we need to win the next general election," he said. Asked if he has "true friends" in politics, Najib said he had friends who were still with him as they were prepared to set aside political agendas and ambitions for the greater good. However, he said, many people had vested interests and political ambitions. "Say a wakil rakyat is not wanted, I have to listen to the people. But as far as the person is concerned, I will get the blame for making the call," he told listeners. He explained that if a politician was dropped, it was because the people had lost confidence in him or her. "Shall we take bets? Not for money of course (laughter). Anything is possible as the election is based on a lot of factors. "We're still gauging the situation. When there's a strong feel-good factor, that's when we should push the button." Najib also denied claims that banks had been reluctant to hand out 100% financing for property worth up to RM400,000 to those earning less than RM3000 a month under the My First Home loan scheme. "According to Bank Negara Malaysia, the success rate is 36.6%," he said in response to a question from a listener. "Hundreds of applications are still under consideration by various local banks,” he said.